Shipping - $7.00 This item does not qualify for our Simple Shipping program. 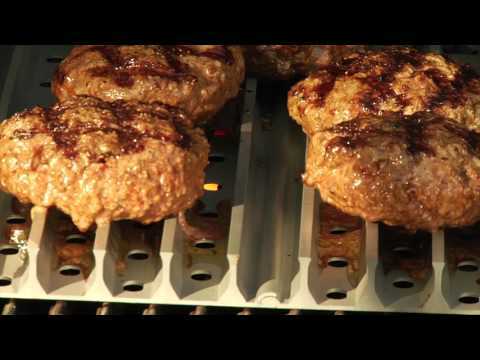 Give your grill a makeover with a GrillGrate that interlocks that fits over any grill surface to amplify heat, even out hot/cold spots and reduce flare-ups. The original raised rail design of the 5 1/4 X 18-inch panel allows for more surface area contact and better heat conduction to get perfect sear lines, while juices collect in the valleys then steam or sizzle adding more flavor and moisture into your food. The shape radiates with heat for fast, even cooking and the bottom protects against flareups and drying heat. The fat drains off and burns in the bottom of the grill grate and not on the outside of your food. The rust-resistant GrillGrate is constructed of aircraft grade aluminum that is hard anodized (a natural hardening process) for an extremely durable surface that withstands heat up to 1000 degrees, and conducts heat better than steel or cast iron. GrillGrate products are made in the USA. 18 1/2" 19 1/4" 20" 17 3/8"